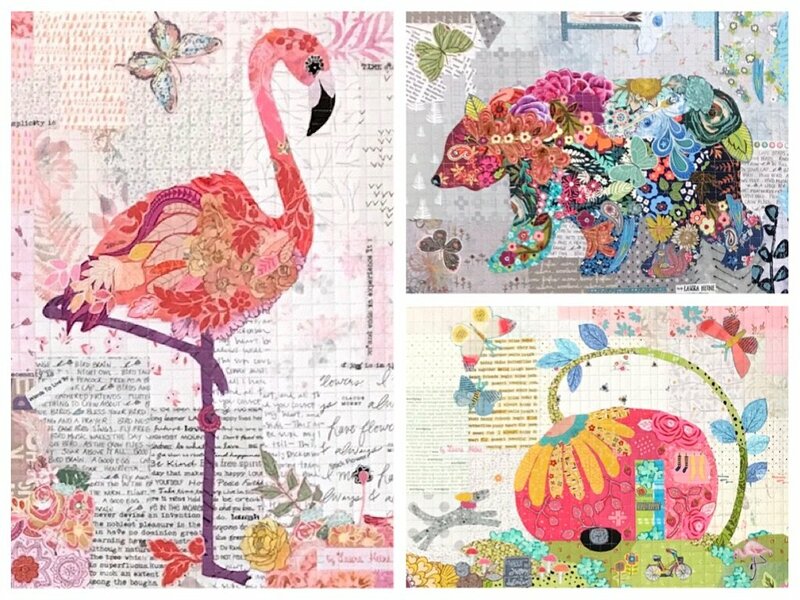 A Laura Heine collage kit and pattern is required for this retreat. You can purchase these on our web site or stop by this shop when you get to town! If there is one you cannot live without, get it while it is still available! Spend two full days creating your collage with Laura by your side!! Learn her techniques and tips! Learn about color and value and not even realize you are learning it! Work with different scales of fabric and turn them into a one-of-a-kind quilt! September 8- Plan to arrive at the resort for appetizers and a cash bar at 6:00 followed by Laura's show and tell at 7:00. September 9- 9:30-4 Making your collage! Dinner provided. September 10 - 9:30-4 Continue with your collage. Finishing and quilting will be covered. Plan to be done by 4pm. You will not need to bring a sewing machine, just the additional supplies (i.e. pattern ease and Steam a Seam 2) on the back of the pattern you choose. Irons, ironing boards, cutting mat and rotary cutters will be available for your use. If you cannot make it by the shop don't worry, Laura will have additional supplies, kits, patterns etc. to purchase at Rock Creek! Your $200.00 deposit is non-refundable and acts as your registration. We will send a notice to the email address you have provided on your order form when the final payment is due (around 60 days prior to the event). If you need to cancel your registration and you notify us within 30 days of the date of the event then a refund minus a 5% processing fee will be given. No refunds will be given for cancellations within the 30 days prior to the event, unless we are able to fill your spot, and only the final payment minus the processing fee will be refunded. You may have the option to move your deposit and final payment to another retreat. You may also transfer your registration to another person.